Residents and businesses of Rye town centre have been notified that normal traffic access will be disrupted between 6pm on Monday January 21 and 6pm Tuesday January 22. This is to facilitate the filming in Rye of some scenes from Netflix’s series 3 royal biopic The Crown. 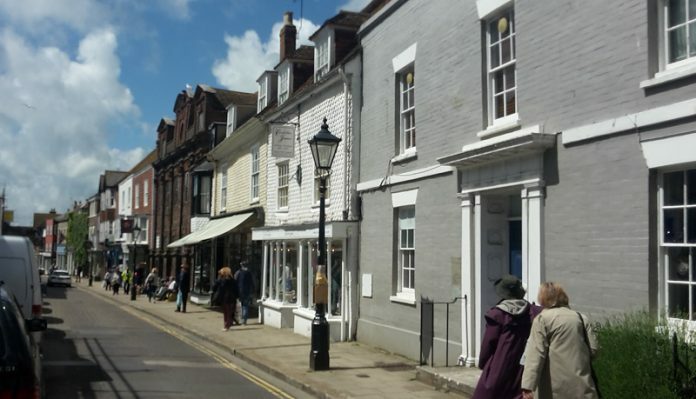 In a letter from LBP Ltd, (Left Bank Pictures, the television film producers), recipients are advised that approvals for car parking suspensions in the High Street and East Street have been obtained as appropriate from council officials, Sussex Police and the Sussex Film Office. It is understood that Rye has been chosen by the producer to provide an alternative setting for Pitlochry, Scotland (some 30 miles southwest of Balmoral) where the action of the film is supposed to take place. It is not clear how the area of the High Street as chosen in particular can simulate the architectural streetscape of Pitlochry but that is not our concern. What is of concern is the question as to what benefit the town of Rye will derive from this exercise? We are reminded that previous filmings in Rye have to some considerable extent benefited the town. In recent memory there was The Monuments Men, when George Clooney stayed in a Rye hostelry and the film company donated the sum of £10,000 to be shared between various local environmental organisations. Then again, the BBC production of EF Benson’s Mapp and Lucia gave an enormous fillip to the local tourist industry. What will The Crown produce? Not a lot, I suspect unless someone makes it their business to seek some advantage. It would be unthinkable for such a high-profile film to be staged in a French town, without the mayor’s office getting directly and purposely involved. All we get in Rye is a note from East Sussex County Council (ESCC)’s library service saying that “the closure of the library may cause some temporary inconvenience to customers, for which we apologise. Maybe ESCC can spell out what economic benefit it has in mind for the citizens of Rye? Previous articleNew ideas for visitors? Next articleLet’s go to a show! I believe that the Town of Rye has every right to receive a major benefit from the financial arrangements ESCC will have made with the film company currently setting up for the filming due to commence on 21st. For example the total resurfacing of the High Street. It’s not that much disruption, it’s fun and interesting, just try to enjoy it. As the “article” states Rye gets chosen as a location frequently which can only be a good thing. I am hoping the council/town is being paid a large fee for this. It would be nice if it were hypothecated to something specific and of general benefit, rather than just going into the coffers. Mapp and Lucia did indeed bring lots of peole into the town, and for a long time afterwards. Not so sure about Monuments Men. The £10,000 fee mentioned for Monuments Men is not over generous for a large chunk of a town. I used to rent my house out for films and adverts in East London, and while we never had long shoots, a week or so would have paid almost that just to the house owner. My neighbours who were perhaps undestandably a bit grumpy about our shoots, learned that if they complained enought to the loction manager, they would sometimes get handfuls of money to go away. I’m not suggesting anyone should do this of course! Very much looking forward to tomorrow! As Rye becomes 1970s’ Pitlochry in the Highlands, can we expect a sort of Groovy Brigadoon and on Wednesday the assorted jolly Scots characters will be gone not to return in another 100 years? Driving from Winchelsea to Pett this morning I came across the Groovy Brigadoon which left Rye overnight, with filming being undertaken at Wickham Manor Farmhouse (home to an ageing Mr Holmes a couple of years ago)! Filming can be fun to watch, as well as bringing favourable publicity and income to the location. I wonder what happened to the previous article on this topic that appeared on RN recently and which now seems to have mysteriously disappeared? Jon, I so agree that filming is fun and generally not too disruptive. However , when the benifiaries are ESCC rather than Rye I believe we should ask questions.